The anti-apartheid leader’s ninety-fifth birthday is an opportunity to honor his legacy; we do that best by remembering him in the context of his times. What is often lost, now that Mandela has achieved the status of wise elder, is the extent to which his victories are owed to significant streaks of both radicalism and Realpolitik running throughout his career—first as a principled revolutionary and later as very much the quintessential consensus-building politician. The most recent Nation articles on Mandela highlighted this paradox. In January 2011, the Chilean-American author Ariel Dorfman wrote about how Mandela expressed concern, in his newly published memoir Conversations With Myself, about being remembered as an otherworldly ethical actor totally separate from difficult, still-unsettled political questions. The end of the racist South African regime is simply inconceivable without the moral capital and charisma Mandela had accumulated during his prison years. As a symbol of dignity and resistance he was, well, irresistible; but the compassion he showed once he was released, the ability to speak to his enemies and bring them to the table, his disposition to forgive (but never to forget) the terror inflicted on him and his people, his willingness to see the good in others, to trust their deepest sense of humanity and honor, turned him into the sort of ethical giant that our species desperately needed in a petty era of devastation and greed. Such a halo can, however, be just as confining as an island where every move and word is guarded. Lawyers, teachers, ministers, factory workers, trade unionists, liberals and radicals have been exiled, banished, banned, imprisoned. Their voices cannot be heard, and they are prevented from hearing the voices of others. Books in which great men expressed noble ideals throughout the ages are prohibited, to publish the words of any person who is or has been banned is a criminal offense. Criticism is communism, thought is sabotage. South Africa has become a vast and terrifying prison. The Nation, like the rest of the world, more or less lost sight of Nelson Mandela for many years after his imprisonment, as more radical—and more violent—opponents of apartheid came to the fore. But all that time Mandela was accruing support (or “moral capital,” as Dorfman later put it), and after rejecting at least one offer of release in exchange for unequivocally rejecting violence—Mandela argued that “a prisoner cannot enter into contracts”—he was finally freed in February 1990. After several fits and starts, he entered negotiations with President F.W. de Klerk, struggling to maintain a broad coalition in the ANC while establishing friendly relationships with government figures. To the same extent that Mandela’s immense political gifts enabled him to successfully—and, to a large extent, peacefully—end minority rule and de jure segregation in South Africa, he also struggled to satisfy the disparate elements in fighting for those goals. The sense of disappointment over Nelson Mandela’s statement in Kenya is all the more acute because, though he consorted with heads of state and other important personages elsewhere, he did not seem to lose his bearings. It would be comforting to think that he will reflect on his experience in Nairobi and that he will come to realize that, despite his reluctance to turn his back on the black African leaders who supported his struggle all these years, it is not the likes of Kenya’s Moi, Zaire’s Mobutu, Somalia’s Siad Barre and Ethiopia’s Mengistu who stand for what he stands for. Notably, South African presidents since Mandela have suffered the same discomfort in trying to distance themselves from African revolutionaries-turned-despots like Robert Mugabe of Zimbabwe and Muammar Qaddafi of Libya. I felt the place strange but comprehensible as merely one more kingdom of denial, unusual mainly for the immense proportion of its majority ghettoized and stripped of all civil rights…It is all part of a hopeless muddle of a modern technological state trying to sustain the most primitive, chest-pounding, Nazi master-race dogmas. So surrealism looms at every turn. Watching from a distance I had found him extraordinarily straightforward in his persistent refusal to pulverize his history to suit current American tastes, crediting Communists for being the first whites to befriend his movement, sometimes at the risk of their lives. Echoes of Miller’s own refusal to testify before the House Un-American Activities Committee in the 1950s are unmistakable. Lacking a reporter’s killer instinct or investigative techniques I was simply very curious about the roots of this man’s unusual character. How does one manage to emerge from nearly three decades in prison with such hopefulness, such inner calm?….It was striking how he never seemed to categorize people by race or even class, and that he spontaneously tended to cite good men even among the enemy. There have been fewer than forty prosecutions for the 10,000 deaths in factional violence. Yet Mandela’s response has been so naïve as to be almost laughable….Mandela’s dilemma is to reconcile his relationships with men who continue to act in bad faith—including de Klerk—with his effort to insure the best deal for South Africa’s black majority. His mistake, perhaps, is that he has continued to show a degree of respect for his negotiating partners that few in the townships consider merited. The victory of South African democracy is not that it has begun to transform lives stunted and impoverished by apartheid. For despite a couple of presidential proclamations…and the promulgation of a Land Restitution Act, little has been done, in these first six months of the Mandela government, to change people’s lives in any physical way. The victory of South African democracy is rather, more simply, that it exists. 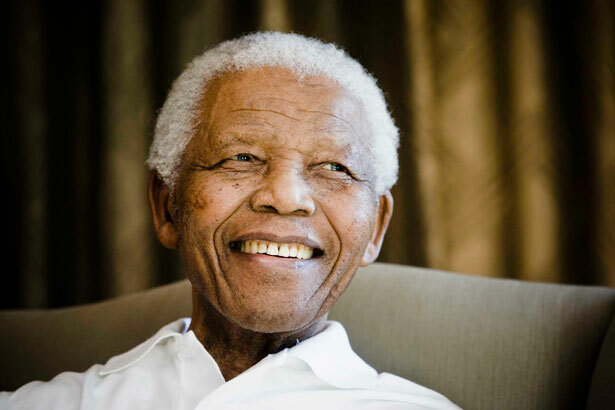 Against all odds and in peace….Whatever the external signifiers, Mandela is there. In fact, his near-seamless statesmanship is largely responsible for what amounts to a transition that is sometimes too smooth to even be noticed. For reasons that are by no means politically unsound, Mandela has nailed his colors to the mast of “reconciliation.” While this has served to still the restive right, it also means the possibility of perpetrators of human rights abuses being called to account is slim indeed. South African’s state-sanctioned arms smugglers, along with its anti-democratic murderers, will go free so that South Africa can have peace. to make him a saint is to extract him from the realm of politics and elevate him to the level of deity. And as long as he resides there, his legacy cannot be fully debated or discussed, because his record is then rooted not in his role as the head of a movement, but in the beatified soul of a man and his conscience. Which brings us back to the first article published about Mandela in The Nation, Hilda Kuper’s review of No Easy Walk to Freedom. “For many non-South Africans,” Kuper wrote in 1966, “South Africa provides a scapegoat on which to project righteous hatred of injustice without risk of involvement in action.” This converse is just as true today: Nelson Mandela provides an icon on which to project righteous love for justice without risk of involvement in action. It is vital, at this pivotal moment, that we nurture a more complete memory of Mandela, one that is situated within the context of the great conflicts of his time—race and class, especially— and with due emphasis on the centrality of risk, involvement, and action to his life and work. That is no less than what the great Madiba deserves.